The Media Create results for Japan are out, and this week has a few interesting talking points to consider in terms of both hardware and software. Starting with the latter, Mario & Luigi: Paper Jam makes its debut in second place with just under 50,000 sales; its launch numbers are actually a little under half the equivalents for predecessor Mario & Luigi: Dream Team, which is sure to disappoint Nintendo and AlphaDream. Nevertheless Monster Hunter X (Cross) follows up its emphatic debut with another 332,478 sales, which is more than the rest of the top 20 combined. Splatoon and Super Mario Maker continue to go well for Wii U, though a Yo-Kai Watch dancing spin-off hasn't had much impact. The top 20 is below with lifetime sales in brackets. Moving onto hardware results, the New 3DS LL (XL) is still well out in front, albeit with an inevitable dip in the second week of the new Monster Hunter release. Of particular note is that the Media Create figures have Wii U showing impressive growth past 30,000 units; it's the shopping season and so all hardware has improved, but it's certainly the strongest performance we've seen from the home console in quite some time. Results are below with last week's sales in brackets. A terrific week for Capcom, once again, while Nintendo will no doubt be pleased with hardware figures and continuing momentum for two key Wii U games. The only slight disappointment is with the new Mario & Luigi game, which isn't matching up to its predecessor's sales. That's a shame. I've got about ten hours logged in Paper Jam so far and I'm really enjoying it. It's certainly not original and borrows heavily from Dream Team, but it's a polished refinement of the core M&L mechanics and plays better than ever. The card system improves on the old badges too. I said the same in the UK chart article but I think the poor sales of M&L is down to Dream Team Bros. Most people don't look for reviews. They'll have bought the last one, been disappointed, and now Paper Jam suffers despite being a better game. This affects all series from all publishers. You see it most easily with yearly games like COD and Assassins Creed. Good games like Advanced Warfare and Black Flag review really well, but sales suffer because they followed poor games like Ghosts and AC3 that put people off. @faint Maybe I should just start listening to you lol. No more predictions from me. What a shame about Paper Jam. Looks like its up to NA to save the day, but it will be hindered by not being available in the shopping season. Very healthy hardware sales though, even though its the holiday season. That could certainly be the reason, plus it hasn't been that long since the last game (2013, if I recall correctly). Fair point about AC3. That game was such a disappointment. Sticker Star scared all the Paper fans away. @Peach64 That's a really good insight. The problem is especially bad because Nintendo's recent games have been recycling assets. They don't look like new games, and that's really off-putting for people who didn't like the games those assets were copied from. @bezerker99 I liked Sticker Star although never got round to finishing it. I picked up Paper Jam a few days ago and finally got round to starting it yesterday. Although I am not far into it I am enjoying what I played so far. They should have gave the handheld Mario rpg's a rest and saved a Paper Mario game for the Wii u or the NX, the Wii u hasn't seen any new Mario rpg's. As for me I just got around to playing BiS, bought it at gamestop yesterday. But I can't say what my favorite M&L game is yet, I've played all but the new Paper Jam, and they really are all incredibly unique and exciting as each other in my eyes. "it's the shopping season and so all hardware has improved"
I am happy to see Splatoon at 4th, and still going strong. It looks like people are happy to see a new IP from Nintendo. Though I think doing a follow-up game to Ice Climbers would be awesome. But honestly, I think the real problem here is monster hunter because if that game didn't show up yet, then obviously this game could have sold better. Think of it if Fates was released now instead of june. Don't think that it could be in a good pace as Monster Hunter here. Yep, a fine example how third parties can ruin the potential games that First parties have to offer. I think Nintendo has done the worst marketing possible for Paper Jam, presenting it as essentially a Mario & Luigi game without an interesting story, with the very same settings and without new characters, while reusing the Dream Team engine and using as little references to the Mario & Luigi series and the Paper Mario series as possible. And who knows, maybe in the intentions of Nintendo, the game had to be like that. Really, I feel bad for AlphaDream because looking at gameplay videos it is evident that they tried to push and get around those boundaries. @Artwark its not worth releasing any handheld game in japan within 4 weeks of a monster hunter launch, it doesn't matter what it is MH will just eat up it's sales. I'm surprised it is doing so badly to be honest. I've been playing it quite a bit and it is even better than Dream Team Bros. (which I really enjoyed to be fair, even if BiS was better). It has all the classic Mario & Luigi humour and the battle system has been improved a ton over Dream Team Bros. I wonder if it is lack of advertising. I haven't seen much info about it anywhere. Mario & Luigi game, which isn't matching up to its predecessor's sales. Maybe, according to reviews, it is not as good as its predecessors, so why would you expect it to do as well. Unless one assumes gamers take no notice of reviews. Shame to see that with paper Jam. I think Dream Team and Sticker Star scared some people away, along with decreasing interest in 3DS in general. I think its time for Mario RPGs to go on a little break. 3DS gets Yokai Watch and Wii U gets Yokai Watch: Just Dance edition? Was AC:aF not enough of an insult for the Wii U? Guess we'll get the last laugh next year when Metroid Prime: Soccer launches. These are just psychical sales numbers, correct? I'm willing to bet Minecraft does better as a PS4 DL then on disc. Nice to see Wii U do so well. Almost the same number of Wii U sold as SMM and Splatoon. Can't be a coincidence even if they are older games. I don't get it. Too many PS4 sold but software sales just don't reflect that. Yes, but that's on a portable, the bread and butter of Japan. Minecraft is not coming to the 3DS, at least as far as we know. Paper Jam looks like a solid game too. Idk what people's problem is lately. Guess people just quit buying fun games. Xenoblade X sales especially insulting all around. It's like come on- there's 11 million Wii U owners, and only a small handful of them want what is arguably one of the best RPG's we'll see this generation? Same for Paper Jam. May not break the mold but it looks decent enough. Certainly good enough to warrant more than 50k sales in Japan. Xbox one decreased in sales lol. Paper Jam will unfortunately suffer in NA to a degree too unfortunately. It won't have the benefit of holiday sales. Even though E3's presentation was disappointing this year, this game really stood out to me. I always thought it was a clever idea. My wife is playing through Xenoblade right now. It is the most stunning thing I've seen on the Wii U. Period. I hope NA has very good sales to make up for the bad/mediocre sales everywhere else. People and reviews openly complained that the Mario & Luigi games have become stale and are in dire need for change. Though I for one love the gameplay and battle system. As for XCX, It lacks the story driven narrative that Japanese gamers want. Though it will bomb in Europe due to it being a JRPG with the Nintendo name on it. North America should outsell both regions combined, though it won't do that well because it's a JRPG and a Nintendo game. @Xenocity I think it will cross the million mark. I hope for two but the U.S. Market is hard to perdict with Nintendo. I see XCX ending up close to the 1M mark globally in sales by the end of Wii U's life. XCX was already released in Japan months ago. Fallout 4 released a month ago and isn't charting in Japan. Paper Jam just isn't popular for other reasons. @Wolfgabe you mean in the U.S.? Or UK? Xenoblade has been out in Japan for a year. Fallout is going to do well for a western game in Japan but is going to flop in Japan. Fallout numbers come out next week. That makes more sense and is possible. North American market heavily sways to AAA blockbuster games, M-rated titles, and established IPs. I mean we will know in a few weeks unless NPD counted the first week in December in November numbers (which come out tomorrow night). Well November 10th release is the worldwide release date for Fallout 4 according to Bethesda. Then Bethesda needs to update it's information. @Xenocity they must think Japan doesn't count. I just went to comings web site. It's like game stop in Japan but less trashy. I'll be picking Paper Jam when it releases here in the US. Next year is already looking to be a lot more packed with 3DS games than last year. Monster Hunter is proof you don't need story driven narrative if the gameplay is solid, and the gameplay is most definitely solid in XCX. I agree NA is where the market is at (and Monolith Soft knows it too- hence the "New L.A. city and United States flag on the ship). The original Xenoblade Chronicles sold over 1 million copies on Wii. This game absolutely needs to improve on that given the universal acclaim and notariety of the series now. If Xenoblade X could hit 2 million global sales by the end of this gen, I would consider that a massive success. 1 million would be the bare minimum though- it HAS to do at least that. Otherwise it's not even matching its predecessor. Which means, XCX really needs to see 1m in North America by the end of this generation. That's a tall order I know, but that's what it needs to see. Very good numbers for both 3DS and Wii U. Japan rocks. @JaxonH see I think the install base is going to be the issue here. I think it will be on par with xenoblade wii in the end which is quite an achievement considering the difference in install base. If XCX hits 1m I'll be amazed. Not that it doesn't deserve to, it's taking my breath away at every turn. I enjoyed both 3DS M&L's! I don't see why there's any issues. How come the original 3DS is selling much better than the 3DS XL? Huge discounts on remaining stock perhaps? @LemonSlice A lot of people probably prefer the lower price point and smaller size. It's nothing to do with third-parties 'ruining' first-party games. Nintendo knew when MH was launching, if they were worried about M&L losing sales they shouldn't have launched at the same time as the bigger game. As it is, they're also making a pile of money out of MH anyway and launching next to the big game is an established tactic. They know MH will have people in stores and visiting the 3DS section so it can actually attract buyers too. @electrolite77 Which is forcing Nintendo to concentrate more on third party support than doing their first party games. Again, I get why they have to do this but keep in mind, third parties can potentially ruin first party developers simply because that's what majority of gamers want which is something that first parties can't emulate the feel that third parties give to gamers. @Freeon-Leon I always wonder this as a PS4 owner, I can only assume Japanese people are either buying them just to look at them. Or as it has usable internal storage, more games are bought digitally therefore masking them somewhat from the results. This year has been all about remake and reboot and sequel thats actually more like a spinoff. If a first-party changes a game to emulate third party games that are more popular, that's their call. It's not the third-party at fault for having a successful game. I really don't think that's something Nintendo do anyway. When you make a game so big and well crafted you get Monster Hunter X sales. 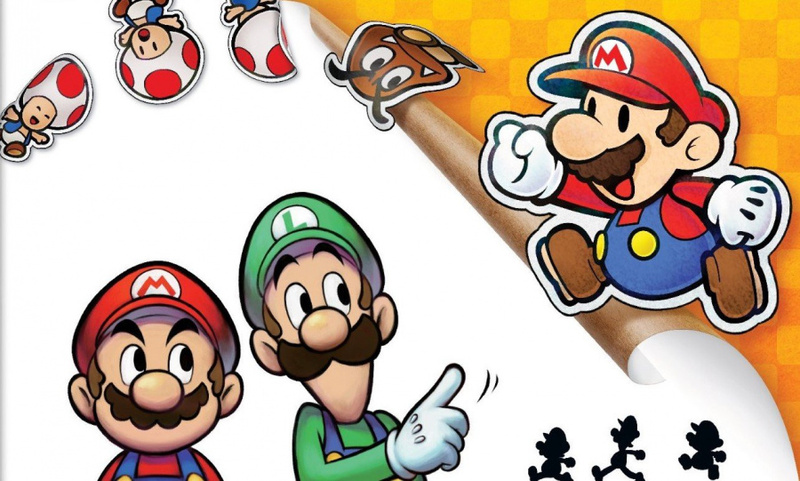 "Mario & Luigi: Paper Jam Makes Underwhelming Debut in Japan"
Hopefully this doesn't mean the end of the series! If something doesn't sell in Japan...then Nintendo doesn't care anymore. @electrolite77 Funny that Monster Hunter is really identical to Pokemon which is a first party game (atleast to a degree) with the only difference being that everything doesn't look friendly in Monster Hunter but you have to kill monsters inorder to make progress and you explore vast areas using equipment kinda like Pokemon if you ask me.